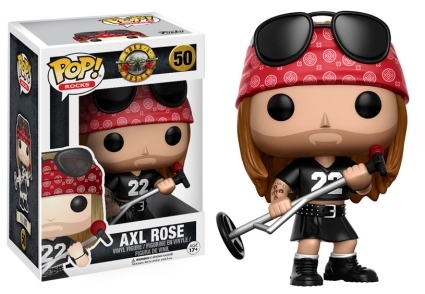 When Axl sang “nothing lasts forever…,” he clearly underestimated those who love the band and all things Funko. The three remaining original members of Guns N’ Roses get stylized with the 2016 Funko Pop Guns N Roses debut release. Even though it took a year for the band’s first album, Appetite for Destruction, to reach the top spot on the Billboard 200 and featured just one song (“Sweet Child o’ Mine”) on the Billboard Hot 100 list, Guns N’ Roses gained a fan base unlike any other hard rock bands at the time. And, despite not initially receiving critical acclaim, GnR was inducted into the Rock and Roll Hall of Fame in 2012. Nearly three decades later, Guns N’ Roses is still going strong and touring with original members Axl, Slash and Duff at the helm. 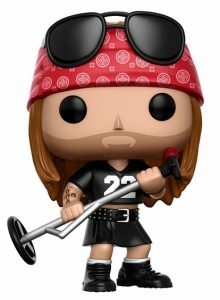 Funko Pop Guns N Roses vinyl figures mix a little of the old and new looks of each rocker. Sorry, ladies, Axl Rose is not wearing his tight, ripped-up jeans. Instead, he is posed wearing a kilt, his iconic bandana and rocking his microphone stand sideways. Of course, Slash hasn’t changed too much over the years which his figure reflects perfectly. The guitarist has shades dominating most of his face, with his long, wavy hair covered by a top hat and a cigarette hanging from his mouth. 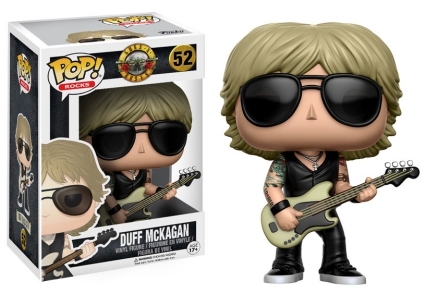 Although the other Funko Pop Guns N Roses figures showcase a glimpse of tattoos, Duff’s are more vibrant and clear. The bassist is posed with his guitar, cross necklace, black wristband and sunglasses. Numbered as part of Pop! 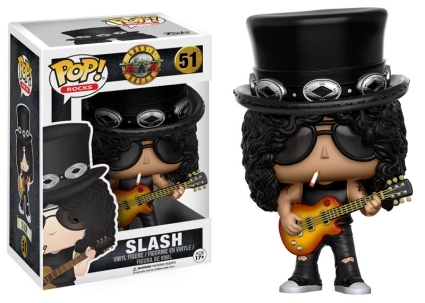 Rocks, the 2016 Funko Pop Guns N Roses vinyl figures appear to fit the standard 3 3/4" size with the exception of Slash whose top hat makes him look slightly taller than his bandmates. 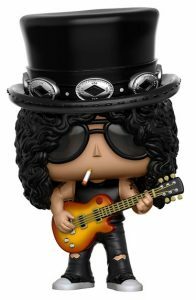 Guns N Roses Pop! Rocks Complete set (3) Funko Pop!